Is a Monthly Subscription Program for Consumable Scentsy Products (things that run out) Such as Scents, Laundry, Clean, Body, & Light bulbs. Your Bar will never be discontinued as long as you subscribe while its still available. And to get it started Scentsy is allowing you to add the July Bring back my Bar and the Discontinued Spring/Summer Scentsy into your Scentsy Club if you add them by Sept 22. This is a Great Perk. For example Skinny dippin is being discontinued August 31st. But if you love a skinny dippin scentsy bar to your Scentsy Club you will Always be able to get that bar in the subscription. But note if you take it out or decrease the amount of bars and it is still discontinued you cant add it back in, or increase it later. only available to Scentsy Club Members. 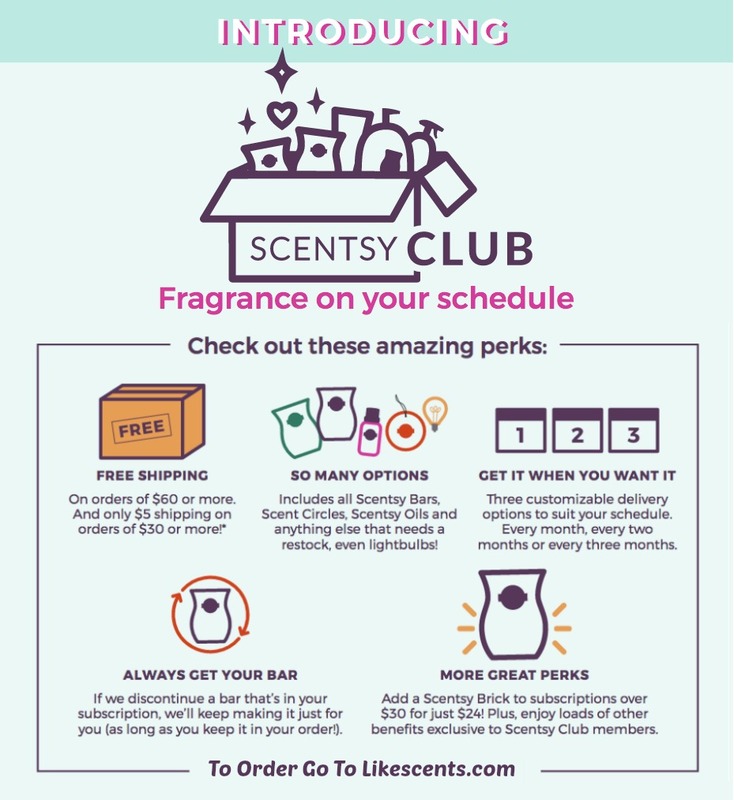 to your Scentsy Club subscription and each subscription your get the New Scent for that month. can be added the Scentsy Club Subscription! to learn more about Whiff box. by Frequency and Product. You can have the subscription sent out every month or every 2 or 3 months. You can also change anything in your subscription up to 20 days prior to the next shipment. as a thank you for Subscribing you will also get Free Scentsy Samples.